New publication in Protein Science, describing the crystal structure and the biochemical characterization of the third SRCR domain of murine Neurotrypsin. Browse the publications of our groups. A structure-integrated curated online database of PLOD mutations, from Federico's group, is now online at http://fornerislab.unipv.it/SiMPLOD. An accompanying publication in The Journal of Bone and Mineral Research, describes the idea behing the database and its functionality. Browse the publications of our groups. New publication in Biochemistry, describing crystal structures of bacterial class I P450 enzymes CYP153s. - Full-text Download. Browse the publications of our groups. Congratulations to Joana Reis, postdoc in our lab, who got an iCARE-2 fellowship, funded by AIRC and the European Union's Horizon 2020 research and innovation programme under the Marie Sk?odowska-Curie grant agreement for the next three years! New publication in Mol Membr Biol, describing strategies to engineer stability in NOX membrane enzymes. Browse the publications of our groups. New publication in Nature Communications, describing the three-dimensional architecture of multifunctional human collagen lysyl hydroxylase and glycosyltransferase LH3. - Press release on UniPV News Website (in Italian) - Press release on Fondazione Cariplo Website (in Italian). Browse the publications of our groups. Congratulations to Marta Ceccon and the NOX group for the "Best Poster" award obtained at the “Biological roles of NADPH Oxidases: Insights into fundamental mechanisms and therapeutic potential” Gordon Research Seminar, Les Diablerets, Switzerland (26-27 May 2018) , with a poster titled: "Biochemical and structural characterization of the NADPH Oxidase NOX5”. Congratulations to Francesca Magnani and the NOX group for the "Best Poster" award obtained at the “Ligand recognition and molecular gating” GRC conference, Ventura, California (4-9 March 2018), with a poster titled: "Crystal structures and atomic model of NADPH oxidase”. New publication in Chemical Reviews, describing the variety of mechanisms adopted by flavoenzymes to activate molecular oxygen. Browse the publications of our groups. New Nature Communications paper, describing development and usage of dual histone deacetylase and demethylase inhibitors to target the LSD1-CoREST-HDAC complex. Browse the publications of our groups. We are pleased to announce the EMBO workshop Enzymes, biocatalysis and chemical biology: The new frontiers, which will take place in Pavia, 09–12 September 2018. New ACS Chem Biol paper, describing implications of FMO5 in drug metabolism. Browse the publications of our groups. This article has received a recommendation from the Faculty of 1000. New JBC paper, describing new relevant features in vanillyl-alcohol oxidase. Browse the publications of our groups. New PNAS paper, describing the crystal structure of bacterial NOX5 fragments and implications of ROS production in various biological processes. Follow this link for a nice summary about NOX enzymes. Browse the publications of our groups. New ChemCatChem paper, describing new biocatalytic reactions for chemical synthesis of ketoisophorone, a result achieved through the ROBOX network. Browse the publications of our groups. New TiBS review describing new mechanisms for flavoproteins as covalent catalysts. Browse the publications of our groups. 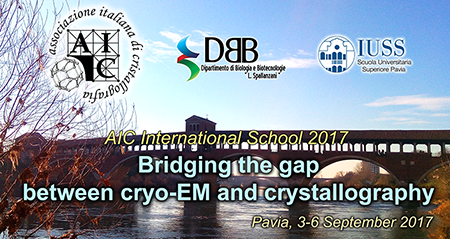 We are pleased to announce the 2017 edition of the Italian Association for Crystallography (AIC) International Crystallography School (AICS2017). This year's school title will be "Bridging the gap between cryo-EM and crystallography". The school will be held in Pavia, Italy, from 3 to 6 September 2017. Our group is part of the OXYTRAIN Marie Curie PhD Program, and positions are available! On Thursday Jan 26th, at 12:00 AM (Aula Buzzati-Traverso), we will host the seminar of Prof. Dario Neri (ETH Zurich), titled "From encoded combinatorial libraries to targeted therapeutics". New JACS paper describing the biochemical and structural properties of a novel fungal Bayer-Villiger Monoxygenase. Browse the publications of our groups. New Angewandte Chemie International Edition paper describing the biochemical and structural characterization of TmCHMO. Browse the publications of our groups. Our Movies and Data Section contains new movies and infographics about our latest discoveries. New BBRC paper describing the distinguishing features of recombinant human dihydroxyacetonephosphate acyl-transferase. Browse the publications of our groups. On Friday November 4th, at 10:00 AM (Aula Falaschi), we will host the seminar of Nancy Gray Ray (President and Chief Executive Officer of Gordon Research Conferences), titled "Non-traditional science career". On Friday October 21st, at 2:30 PM (Aula Buzzati-Traverso), we will host the seminar of Dr. Fabrizio Martino (CIB Madrid), titled "High-resolution structure investigation of protein complexes bound to the nucleosome core particle". New Science Advances paper describing two new classes of non-covalent LSD1 inhibitors with highly unusual structural features. Watch the Movie related to our paper - Browse the publications of our groups. New Current Opinions in Structural Biology review describing the structural and functional complexity of histone demethylase LSD1. Browse the publications of our groups. New Nature Protocols paper describing protocols and advice are given on how to develop thermostability assays for membrane proteins and how to combine mutations to make an optimally stable mutant suitable for structural studies. Browse the publications of our groups. New Nature Communications paper describing the discovery of a new post-Golgi trafficking pathway for the enzyme LH3/PLOD3 critical for collagen homeostasis. Browse the publications of our groups. On Tuesday Jul 12th, we will host the seminars of Prof. Mauro Gemmi (IIT Pisa), titled "Electron diffraction as a tool for solving the crystal structure of organic molecules: from pharmaceuticals to proteins", and the seminar from Prof. Filippo Mancia (Columbia University, NY), titled "Cryo-EM structure of the STRA6 receptor for retinol uptake". On Monday June 6th, at 3:00 PM (Aula Buzzati-Traverso), we will host the seminar of Dr. Arjen J. Jakobi (EMBL Heidelberg), titled "Challenges for high-resolution 3D cryo-EM of macromolecular complexes: a case study of RNA Pol III and TMV". New Hum Mol Gen paper describing the biochemical and structural characterization of pathogenic mutations of LSD1/KDM1a associated to a form of intellectual disability. Browse the publications of our groups. On Friday Apr 29th, we will host the seminars of Prof. Stefano Piccolo (Univ. Padova), titled "Role of YAP/TAZ in stem cells and cancer", and the seminar from Prof. Daniela Rhodes (NTU Singapore), titled "Telomerase and the role of G-quadruplexes in biology". Next Friday Apr 15th, at 1:00 PM (Aula Buzzati-Traverso), we will host the seminar of Dr. Jean-Nicholas Longchamp (Univ. Zurich), titled "Enabling structural biology at the truly single molecule level". New EMBO J paper showing the three-dimensional structures of human and viral complement regulators. Browse the publications of our groups. New Proteins paper describing the three-dimensional structure of 7beta-hydroxysteroid dehydrogenase. Browse the publications of our groups. New EMBO J review describing the mechanisms of interactions between protein regulators and nucleosomes. Browse the publications of our groups. New ACS Chem Biol paper describing the discovery of FMO5 as an enzyme catalyst for Baeyer-Villiger reactions in Humans. Browse the publications of our groups. We wish to send our warmest congratulations to Valentina Piano, postdoc in our lab, who got a 1-year FIRC-AIRC (Italian Foundation for Cancer Research) "Fernando Giampaolo Gnudi e Chiarina Ventura" Fellowship. New ACS Chem Biol paper describing new inhibitors for the Ether Lipid-Generating Enzyme AGPS as Anti-Cancer Agents. Browse the publications of our groups. We wish to send our warmest congratulations to Valentina Speranzini, postdoc in our lab, who got the young investigator Chiara D'Onofrio Prize for her oral presentation at SIBBM 2015! Our yearly lab retreat is coming soon! From Thursday, March 25th, to Saturday, March 27th, our groups and collaborators will gather at Park Hotel Olimpia at Brallo di Pregola for networking, excellent science, and good food! New PNAS paper describing how, using SAXS and biophysics, we elucidated the interactions among the LSD1-CoREST complex, the histone H3 tail and the DNA. Watch the Movie related to our paper - Browse the publications of our groups. New ACS Med Chem Lett describing new enzyme selectivity and in-cell studies on Tranylcypromine-based LSD1 inhibitors. Browse the publications of our groups. The last month has been very fruitful in term of fund raising and we expect several pre- and post-doctoral open positions on various projects in the next few months. New J. Am. Chem. Soc. article describing how to turn a Baeyer-Villiger Monooxygenase into a NADPH Oxidase. Browse the publications of our groups. On Dec 22nd, at 2:15 PM, there will be a seminar from Dr. F. Mancia, titled Exploring Membrane Protein Landscape: Experience from the New York Consortium on Membrane Protein Structure (NYCOMPS). Seminar Flyer. On Dec 4th, at 4:15 PM, there will be a seminar from Dr. L. Tamagnone, titled Semaphorin signalling controlling cancer cells and the tumour microenvironment. Seminar Flyer. On Dec 19th, starting at 09:30 AM, The IUSS PhD candidates will defend their theses. The event will be held at the University of Pavia/Institute for Superior Studies (IUSS), in Piazza Vittoria. Martina Palamini and Nguyen Quoc-Thai joined Federico's and Andrea's reasearch teams, respectively, as PhD Students with University of Pavia/Institute for Superior Studies (IUSS) PhD fellowships. Our PhD fellow Valentina Speranzini published an application note on the usage of our ClarioStar Plate Reader titled Protein-Ligand binding measurements using fluorescence polarization. Link to the Application Note. New Eur J Med Chem article describing 1-substituted cyclopropylamine derivatives as irreversible inhibitors of histone demethylase LSD1. Browse the publications of our groups. On September 4th, at 6:00 PM, Venki Ramakrishnan, Nobel Prize in Chemistry 2009 for studies of the structure and function of the ribosome, will give a lecture about The use of recent advances in electron microscopy to study ribosome structures. Seminar Flyer. On June 3rd, at 3:00 PM, there will be a seminar about usage from Dr. N. Luzzietti, titled Some like it hot: Drug Analytics using MicroScale Thermophoresis. Seminar Flyer. We wish to send our warmest welcome to Francesca Magnani, who joined Andrea's research team. Prof. Annalisa Pastore will give a short course about biological NMR at our University during next week. This short course is part of the Master Course in Molecular Biology and Genetics. Course Flyer. The PDF files for the teaching lectures given by Prof. D.E. Edmondson during the Master Course in Molecular Biology and Genetics are available for download following this link. We wish to send our warmest welcome to Kaouthar Dridi, who joined Federico's research team. Our yearly lab retreat is coming soon! From Thursday, March 27th, to Saturday, March 29th, we will all gather at Agriturismo Cà del Monte for networking, excellent science, and good food! Installation of our new Clariostar Plate Reader has been completed and the new instrument is available to users. Federico Forneris has been awarded the Programma Giovani Ricercatori Rita Levi-Montalcini grant. Through this grant his group will extend the investigation on important bio-medical targets of the neuromuscular junctions and establish new research infrastructure in our department. We all wish to congratulate with him!. Next Friday Feb 7th, at 1:00 PM, we will host the seminar of Dr. Francesca Magnani, titled Production of eukaryotic membrane proteins for structural studies. We are proud to present the new layout of our website, representing now the entire Division of Structural Biology of the Department of Biology and Biotechnology, University of Pavia. The division is composed of the research groups led by Prof. Andrea Mattevi, Dr. Claudia Binda, and Dr. Federico Forneris. The 1st European Crystallography School (part of the celebrations for the International Year of Crystallography) will be hosted in Pavia, from 28th Aug to 6th Sep, 2014. Deadline for registrations is 9th Feb, 2014. More info on the School Website. 19/12/2013 - They are Doctors Now! Congratulations to Giuseppe Ciossani and Christian Martinoli for successfully defending their PhD thesis! 24/10/2013 - We are Growing! The new website of the structural biology group led by Federico Forneris is online, and Open Positions are available! Congratulations to Elena Battaglioli who led the joint study on LSD1 neurospecific variant, now published in J. Neurochemistry. 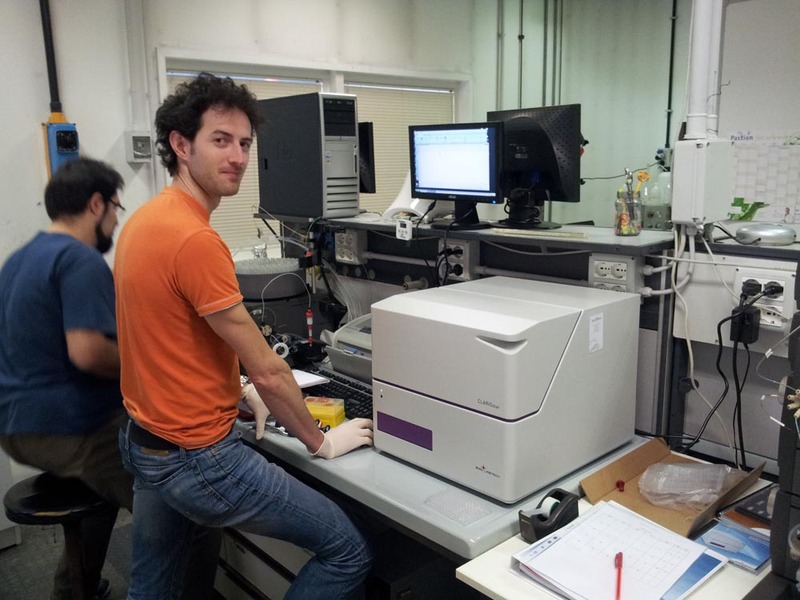 We wish to say welcome back to our former PhD student Aristotele Karytinos, who rejoined our team for a postdoc. 01/10/2013 - Something new is coming up! Federico Forneris, former PhD student in our lab, will establish his new group in 2014 in our Department with the support of a grant from the Armenise-Harvard Foundation.